A brand new update for Google Maps just started rolling out last night and it's definitely a big one. Perhaps the most important detail is that this is the first installable on the Android N Developer Previews. The Timeline screen has also gone through a partial redesign and gained a couple of new tricks. However, the really interesting things are coming in the teardown. In fact, there's so much stuff that the teardown portion is going to be split into a second part. Let's get to the good stuff. Note: according to a post on the issue tracker, this could be a beta release. However, it seems to be rolling out to users on the stable channel. It probably doesn't matter, but it may be possible some users won't receive this update through regular rollouts. I've included "beta" in the title so readers are aware of this. This actually resolves a point of confusion for many users: the missing Android Wear app. One of the little-known details about the repackaged apps on developer previews is that they lack the microAPKs that should be installed on Wear devices. I'm not sure if there's an official reason for leaving them out, but they aren't there and that means your watch will be missing quite a few standard features. This release restores the Wear micro app to its rightful place. Left: previous version. Right: latest version. The most notable changes for this release can be seen in the Timeline view. In fact, the changes are almost entirely limited to the title bar, which has grown much taller and includes a couple new parts. The month/year dropdown has been removed entirely, but the calendar next to its left has been moved to the right side. It still functions the same way, so this is mostly a cosmetic adjustment. The date and day of the week have also been removed from the first row below the mini map. It also looks like the mini map might show more business icons than it used to. There's a new edit button (the pen icon) that opens a screen where a title and note can be added. Tapping on the big date text above the mini map will also open this screen. 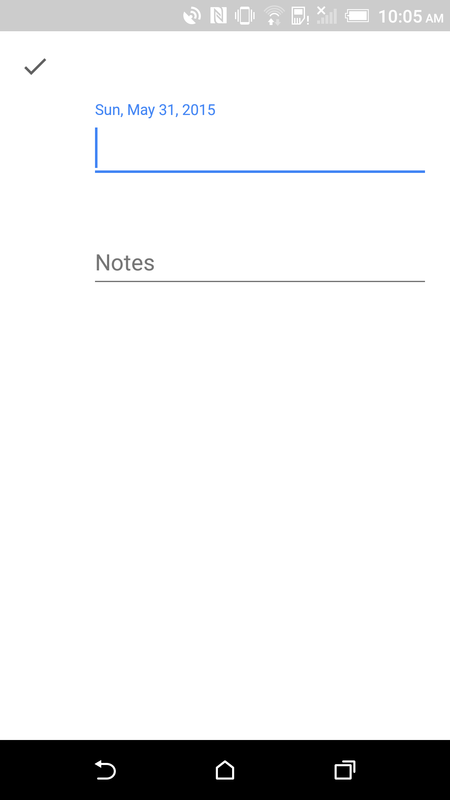 If something is filled in here, it causes the date to shrink in the Timeline screen while the title and note are filled in. 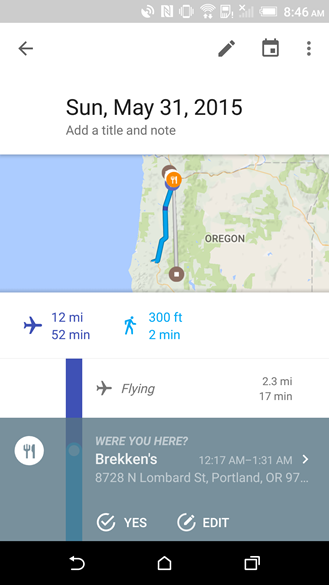 This allows you to put some context to your trips, perhaps to document a delivery route or remind you of a particular day during vacation. We're still looking around for some other changes, so let us know in the comments if anything else turns up. The big news for this update is in the teardown, so let's get straight to part 1. 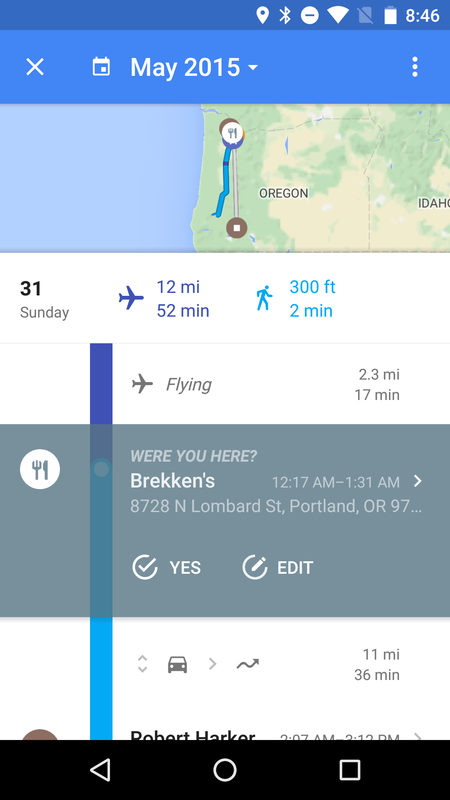 It has been one of the hottest requests since Offline Navigation and Search were added to Maps–if not before–and it's finally happening. Google is going to add support for storing offline maps on SD cards. This will give users the ability to free up some internal storage by moving those large data files where they won't be in the way. The strings related to storing offline maps on an SD card are mostly uninteresting, so there's not much to read into here. In fact, most of them are just copies of existing strings, but with "SD card" in place of other words. However, one warning message does point out a potentially annoying issue for some: switching your storage location requires a total re-download of your offline maps. For some reason they can't be moved from one local storage to another. This probably won't be a huge issue since most people will only have to make the switch to an SD card once, but even that one switch could be a problem for people with no access to Wi-Fi and very restricted cellular data. There's no doubt that this will be a welcome feature, especially for people with Android One phones or any device that lacks Marshmallow's adoptable storage feature. My only real question is whether or not this will be strictly limited to SD cards or if it can also be used with USB drives. Since many phones (*cough* Nexus *cough*) lack an SD slot, the reach for offline maps is a little limited. But it could be the perfect use case for very small external drives. After all, when you're driving down city streets with your phone locked into a dash mount, you're not going to care about having a little key-sized drive poking out to the side.